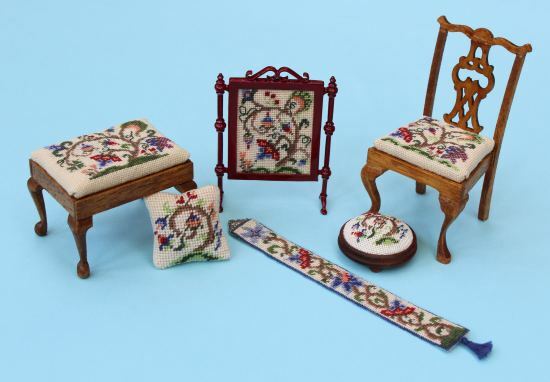 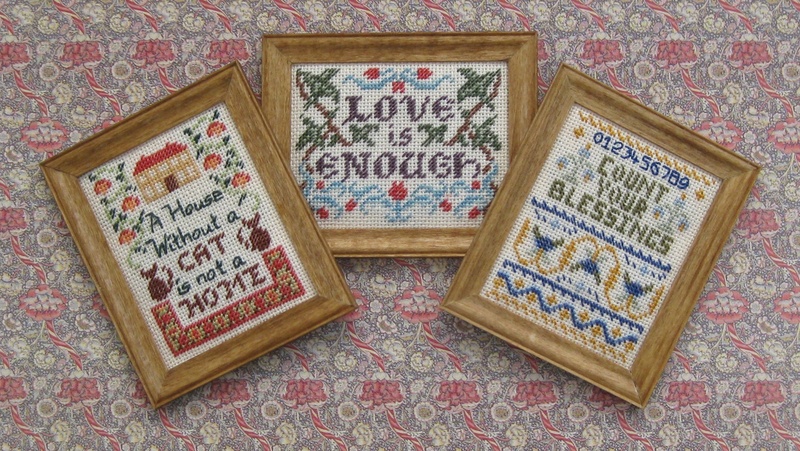 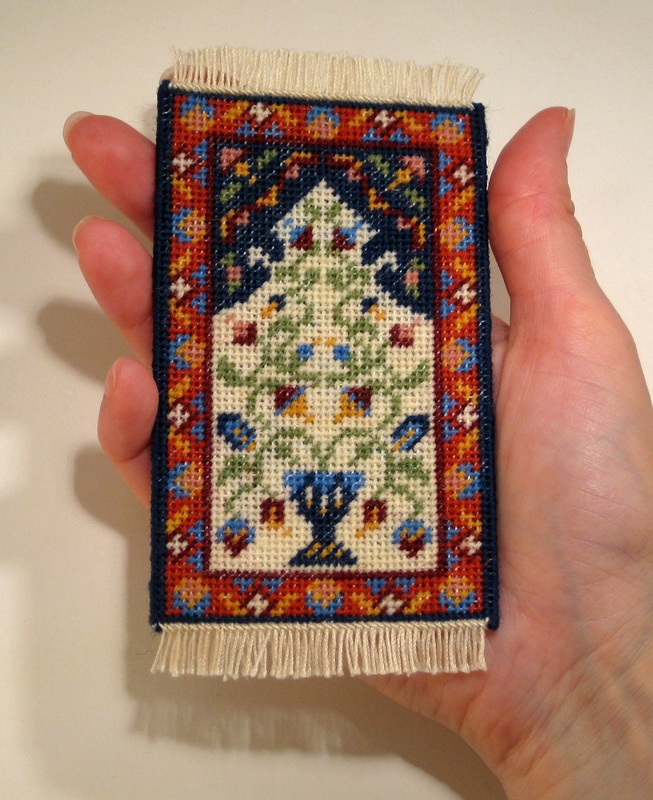 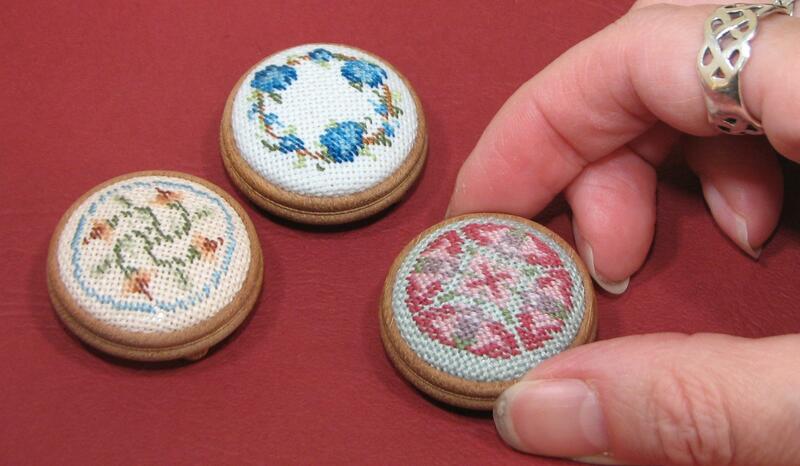 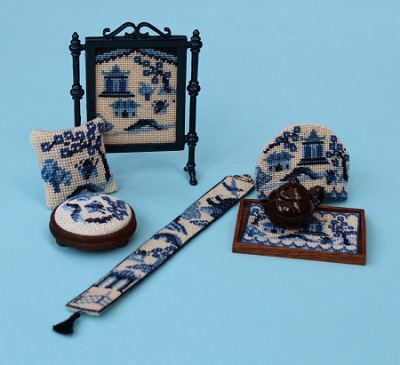 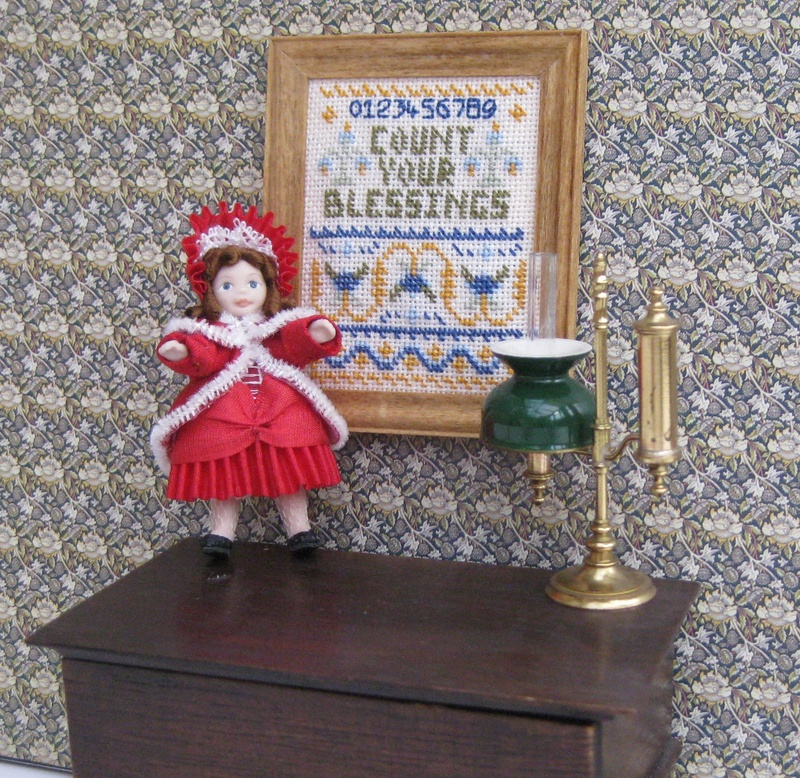 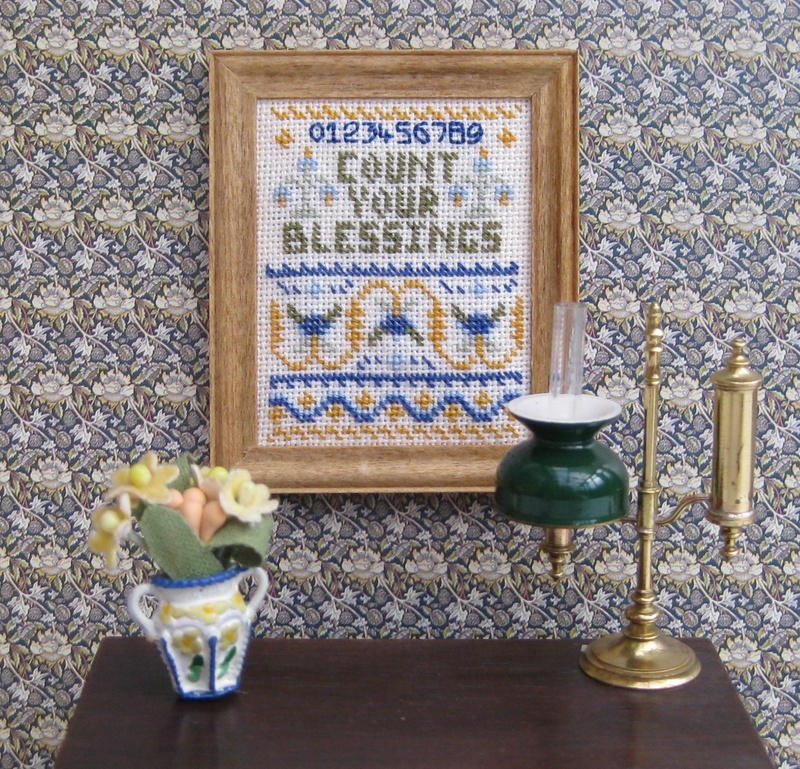 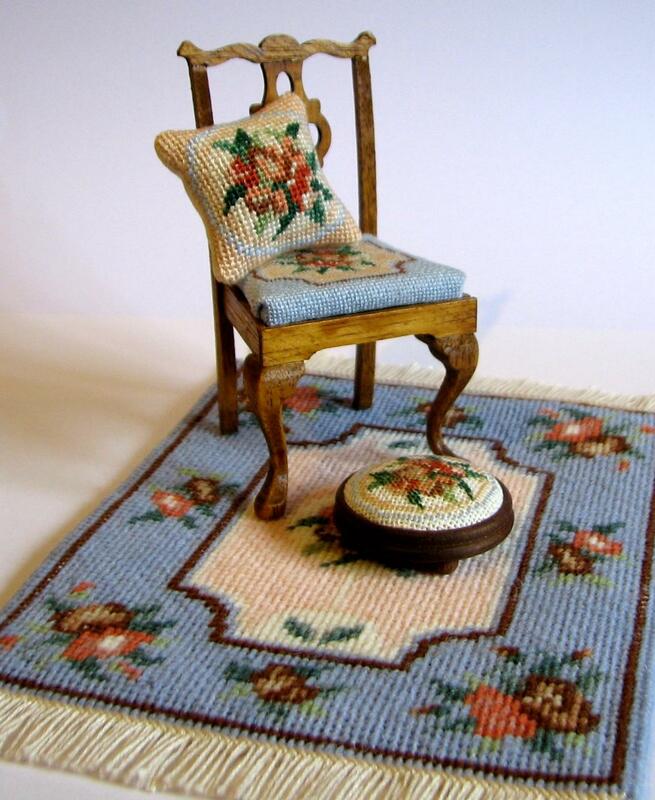 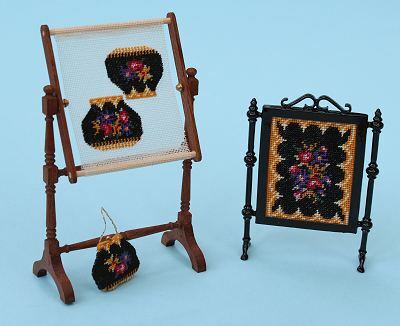 I’ve recently added two new designs to my range of doll’s house needlepoint firescreens kits. 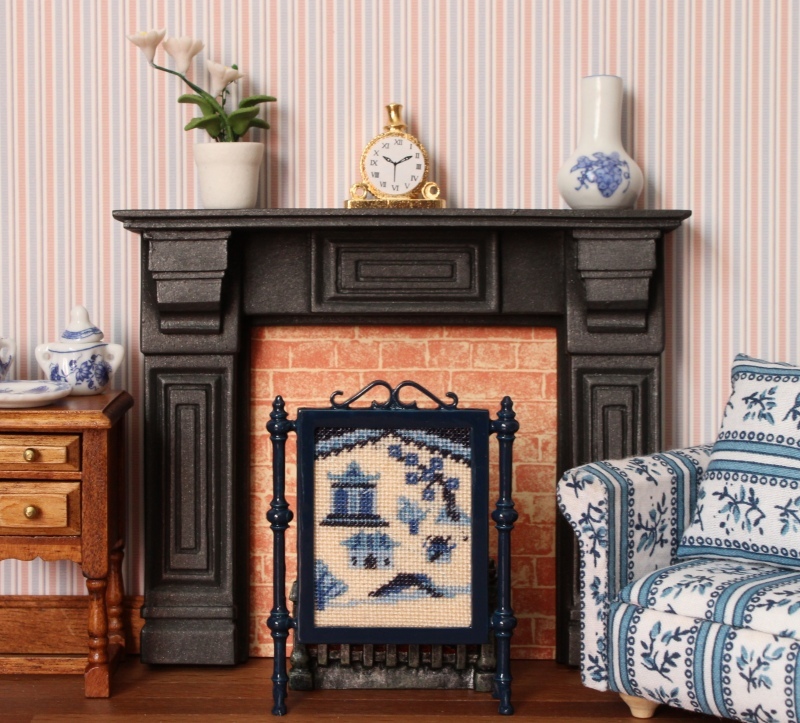 Today, I took a photo of the ‘Alice (blue)’ one, in a doll’s house room, to give you an idea of what it looks like in situ (there’s also a green colourway available). 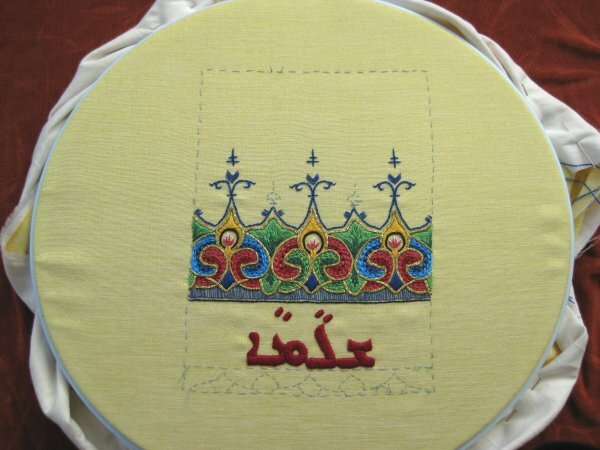 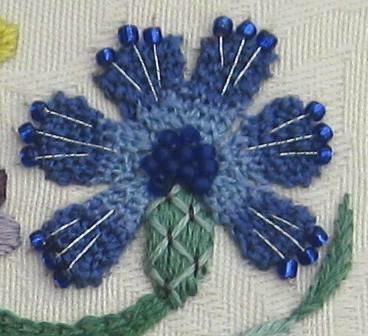 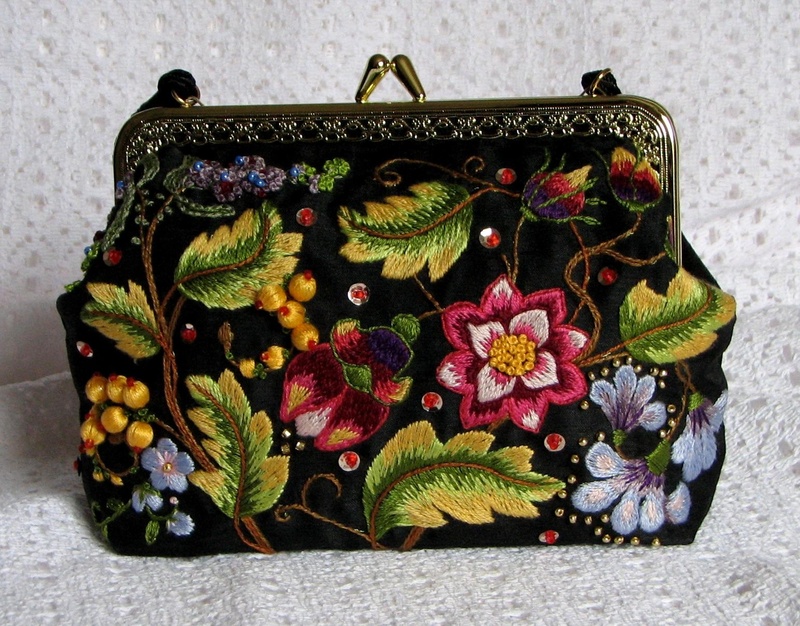 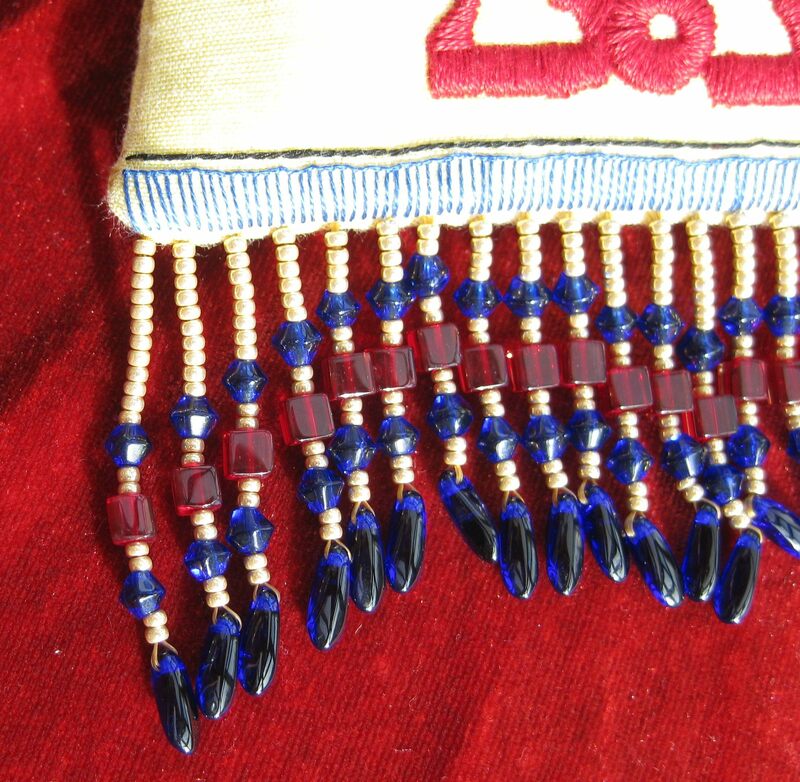 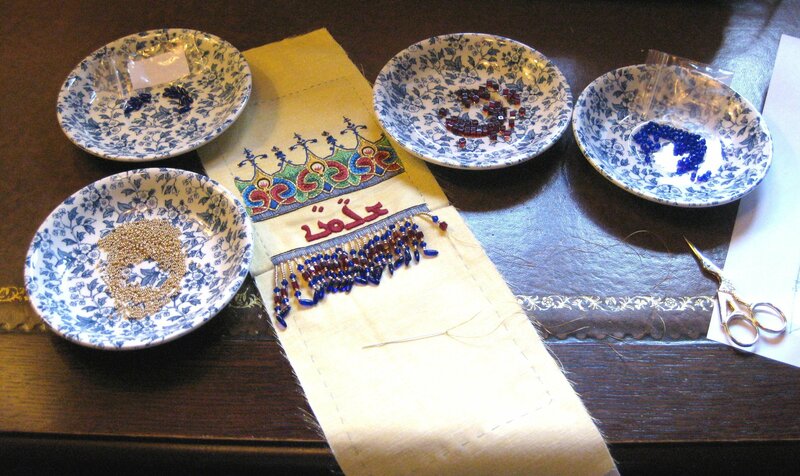 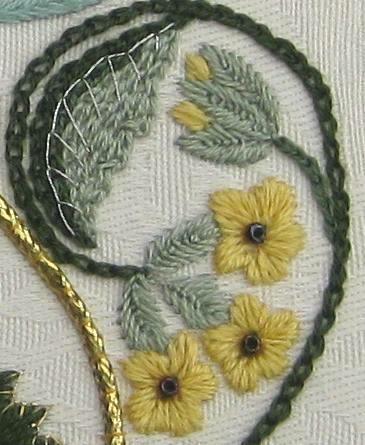 As you can see from the picture, there are several other co-ordinating items that can be stitched to go with the firescreen. 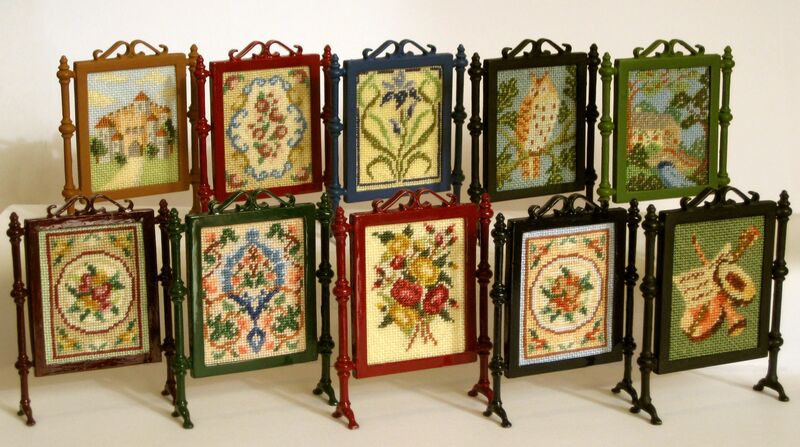 There are ten designs of firescreen available. 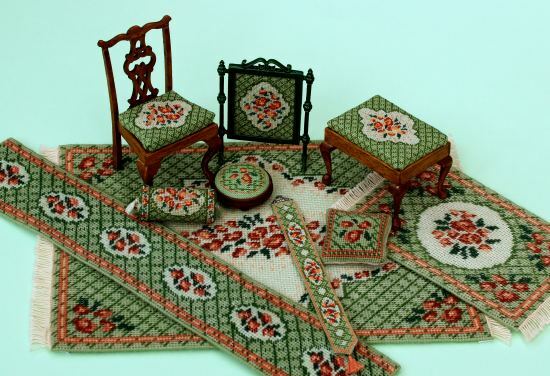 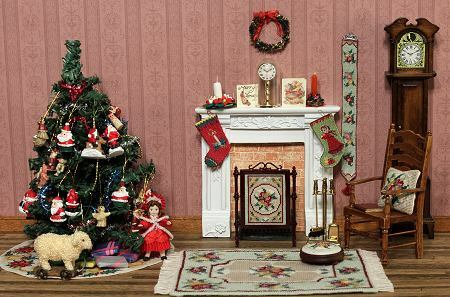 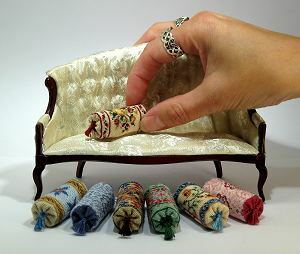 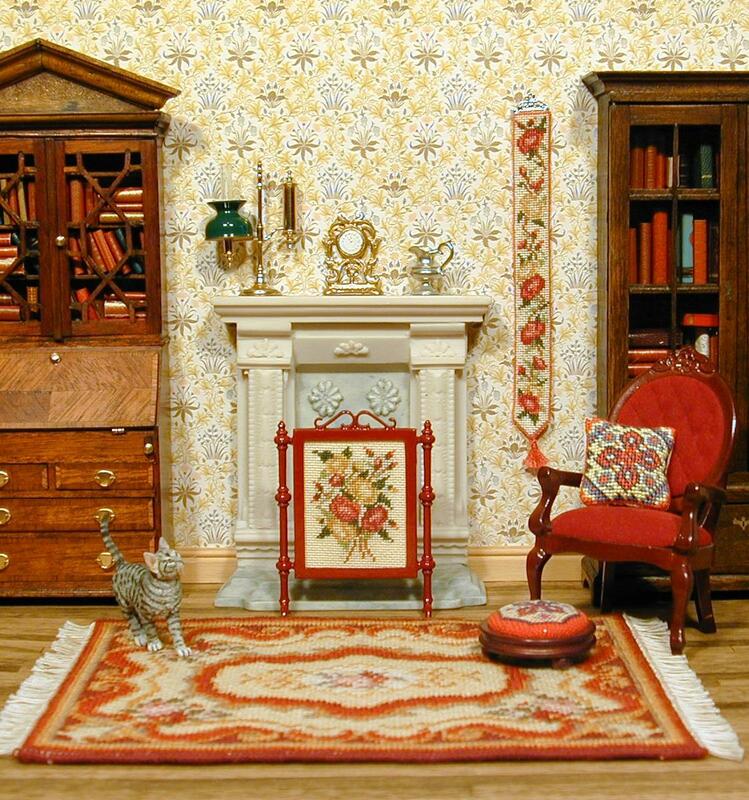 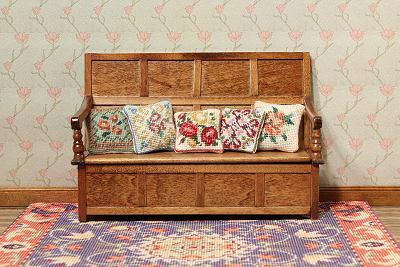 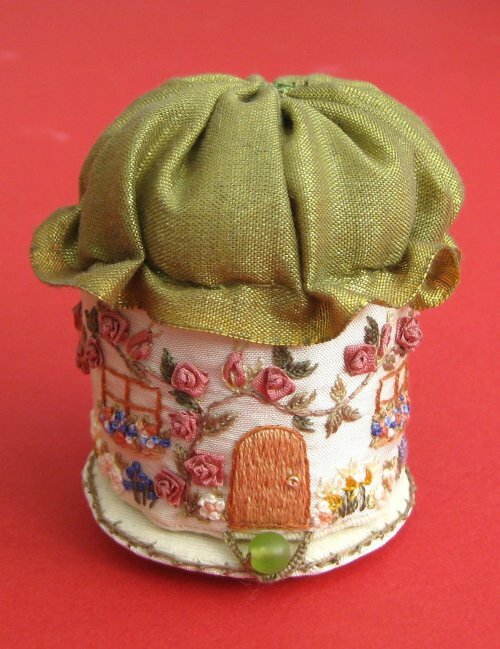 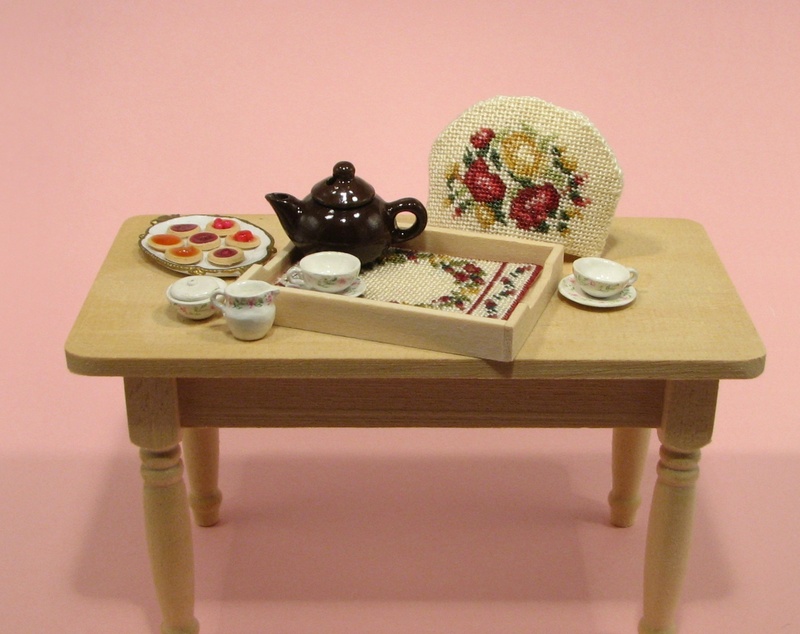 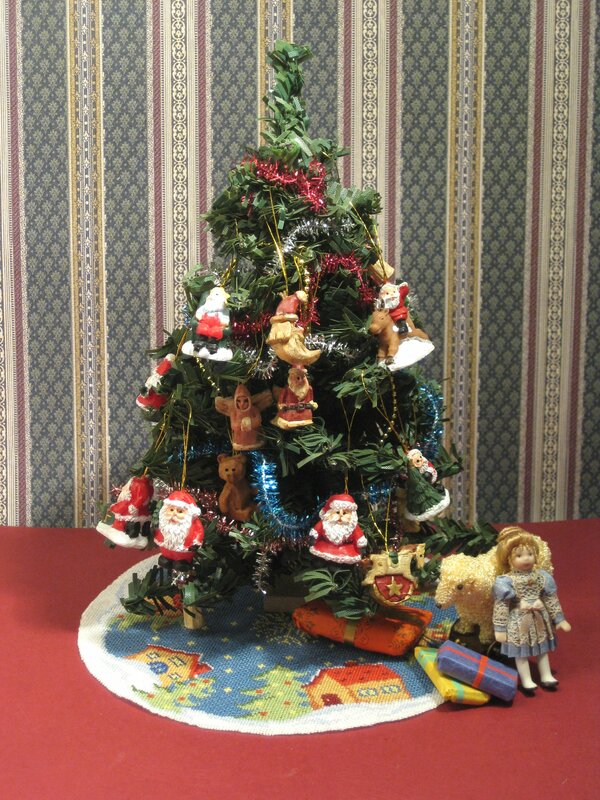 They cover many eras and styles, and give a stunning range suitable for many types of room in your doll’s house. 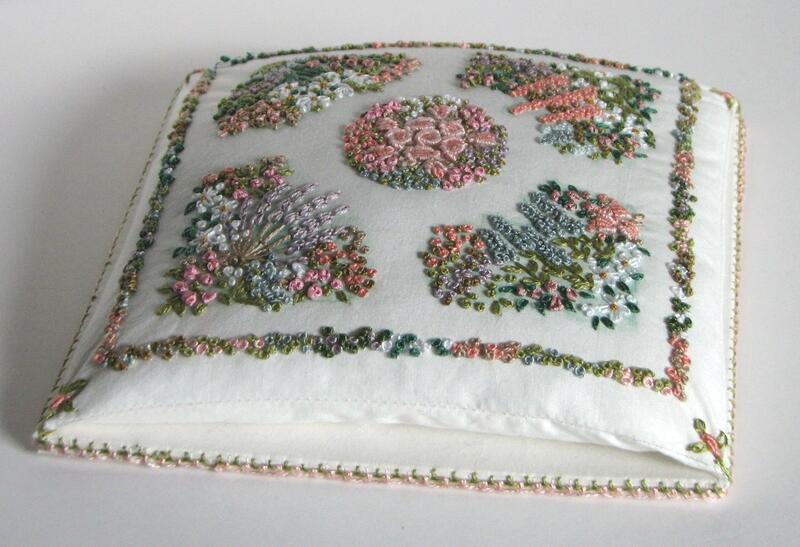 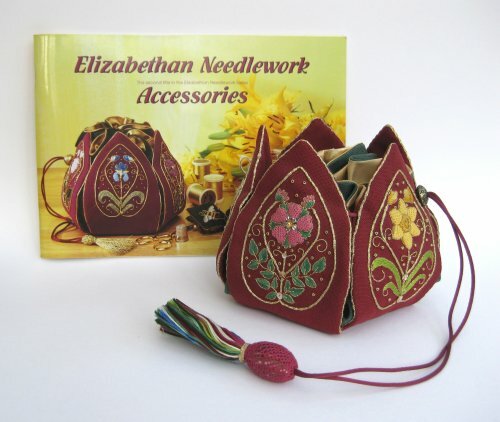 The fabric provided in these kits is 32 count gauze, and plenty of Anchor stranded cotton is included, too, for working the design in tent stitch (similar to half cross stitch). 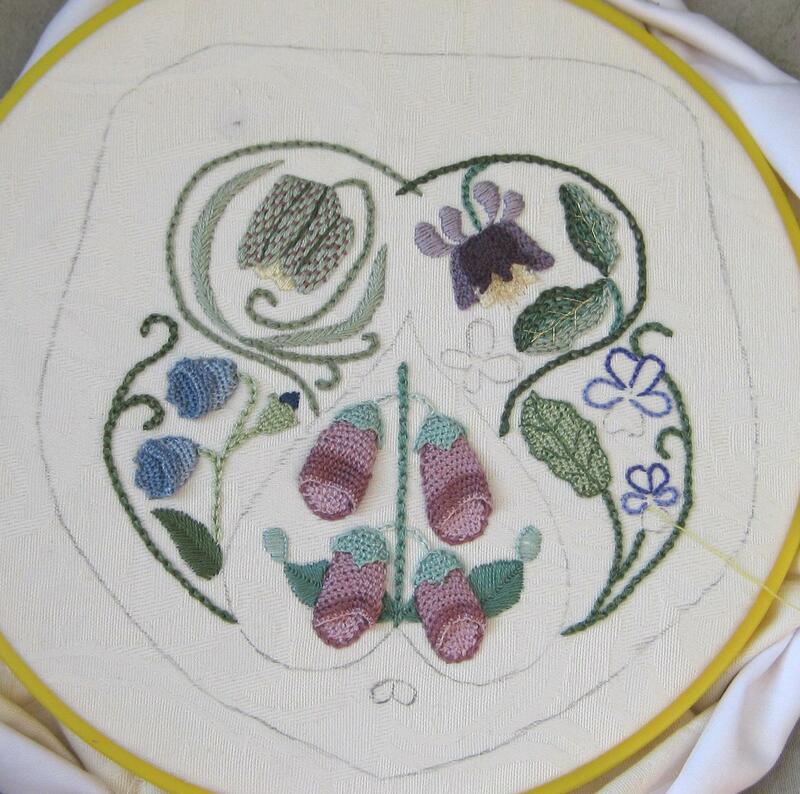 It is simple to work from the colour block chart, and these designs ‘grow’ quickly – silk gauze is easier to stitch on than it sounds! 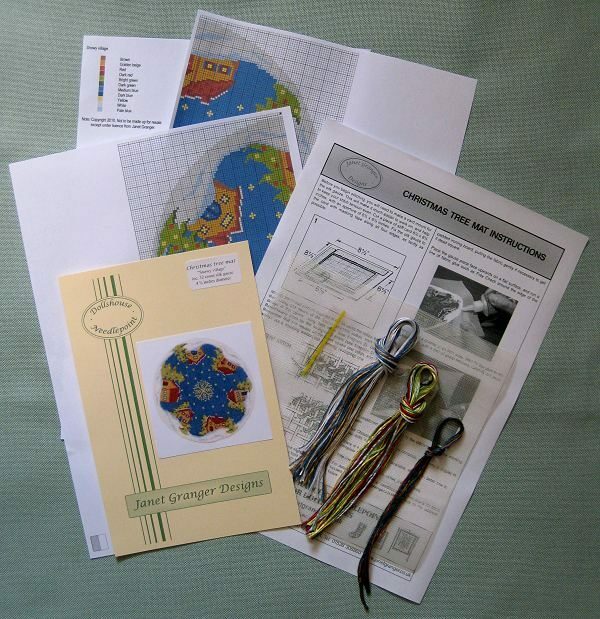 Detailed instructions and diagrams guide you through, including how to assemble the high-quality white metal firescreen kit, which comes as three pieces which are simply glued together with contact adhesive. 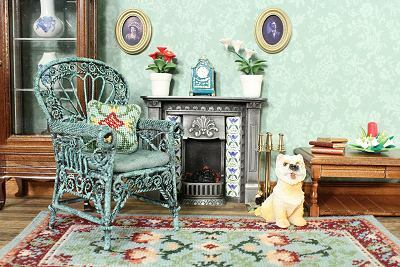 The frame can then be primed and finished off with either a gloss or matt enamel paint of your choice. 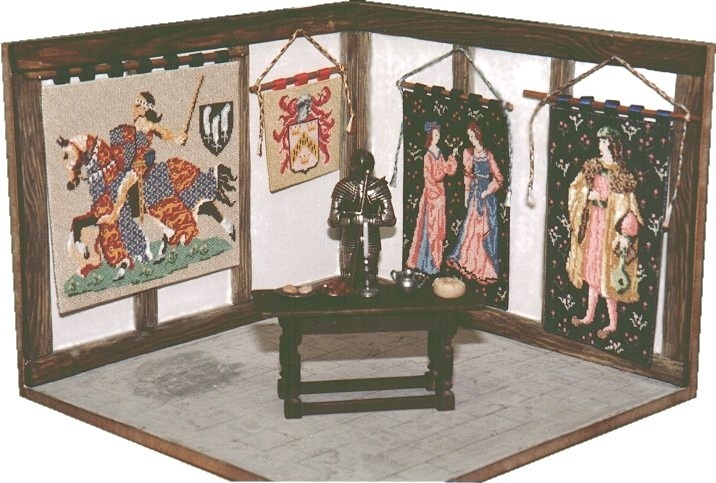 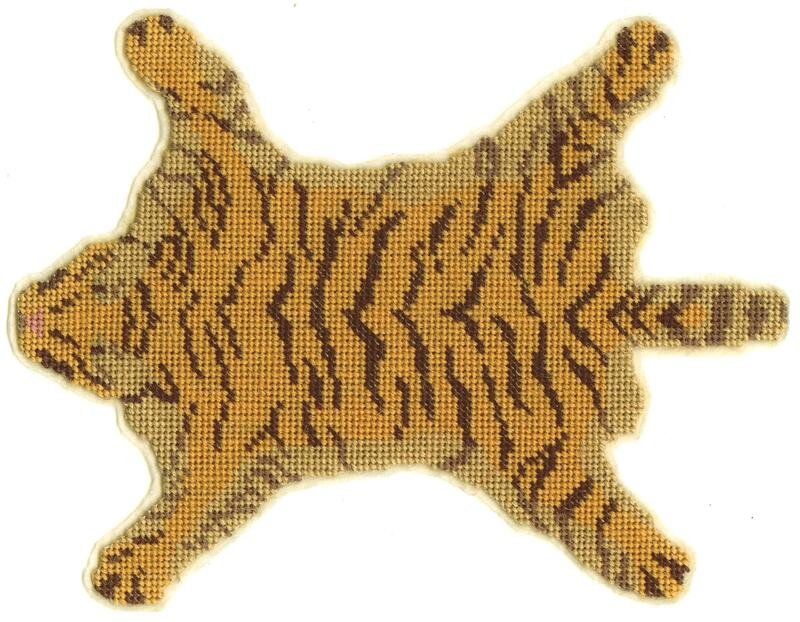 The Humbrol shade that I used for each firescreen, easily obtained from hobby shops, is listed on the relevant instruction sheet. 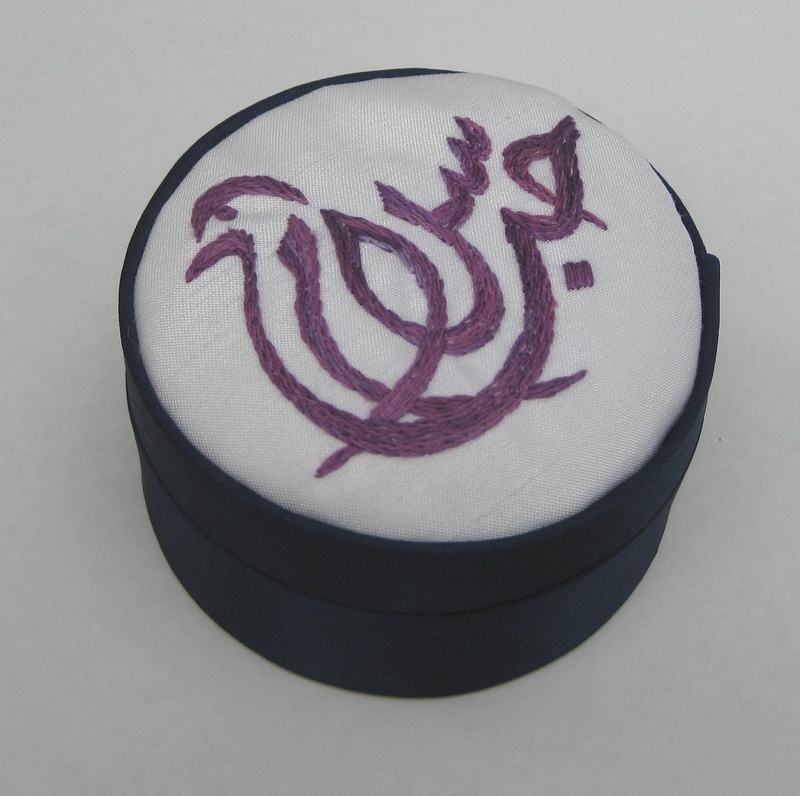 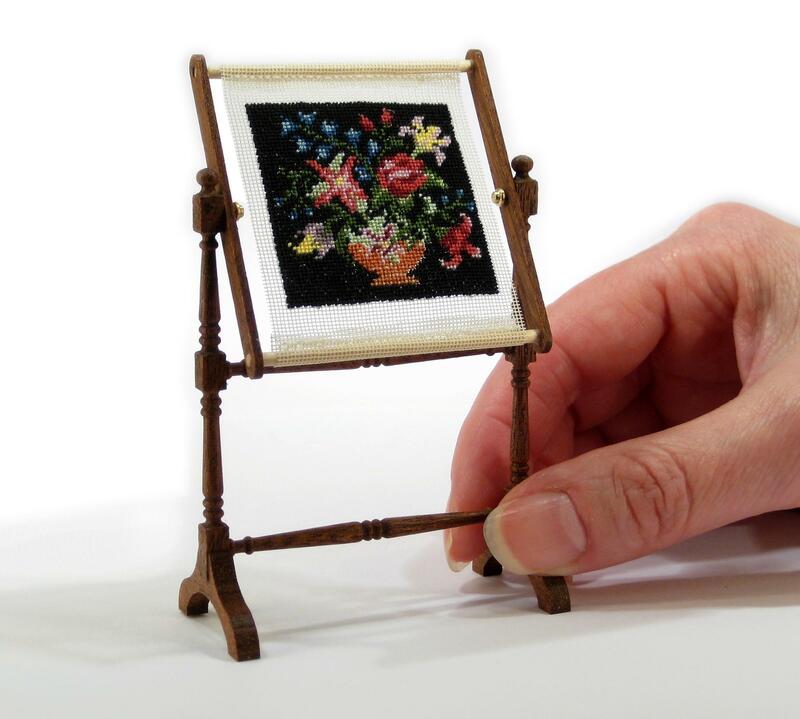 Full instructions for how to mount the finished stitching neatly in the frame are included in the kit, which comes in a smart plastic box, perfect for a gift (to a friend, or yourself!). 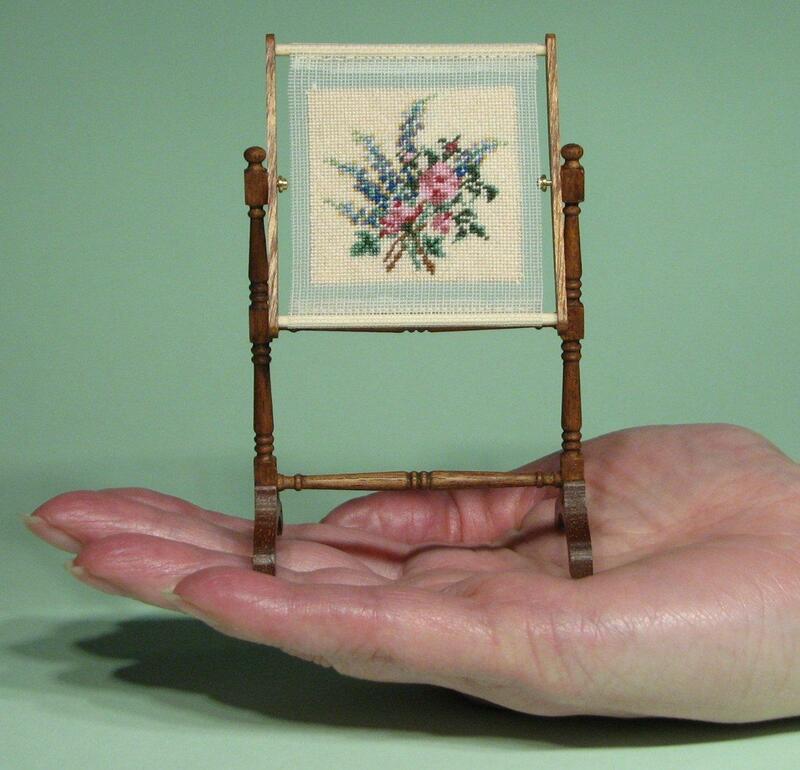 The actual dimensions of the finished firescreen frame are: height 2 ¾ ins / 68 mm, width 2 ins / 52 mm. 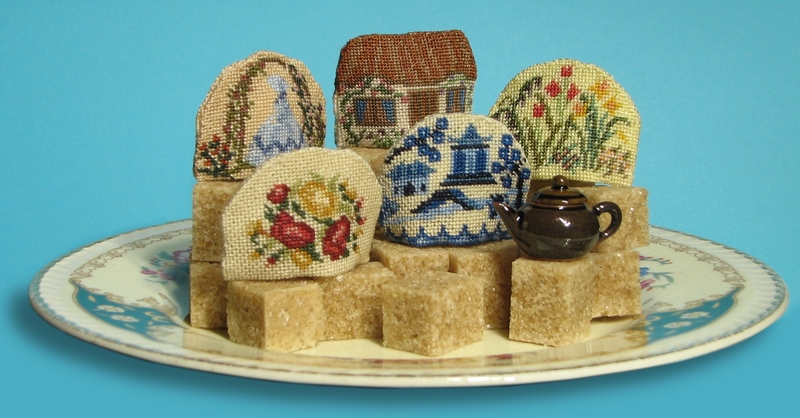 All the kits are available from my website www.janetgranger.co.uk There is a free online tutorial here which shows you exactly how to make one of these. 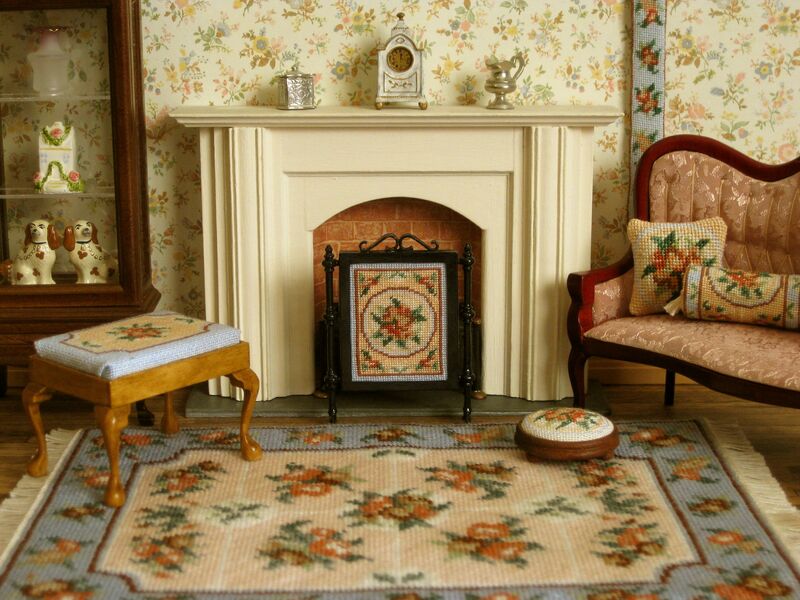 The firescreen kits cost 19.95 GBP, with free shipping worldwide. 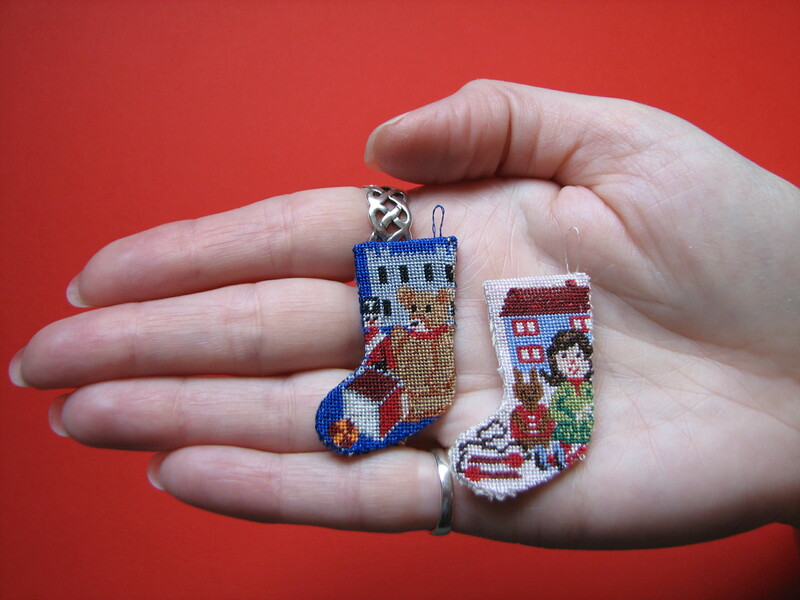 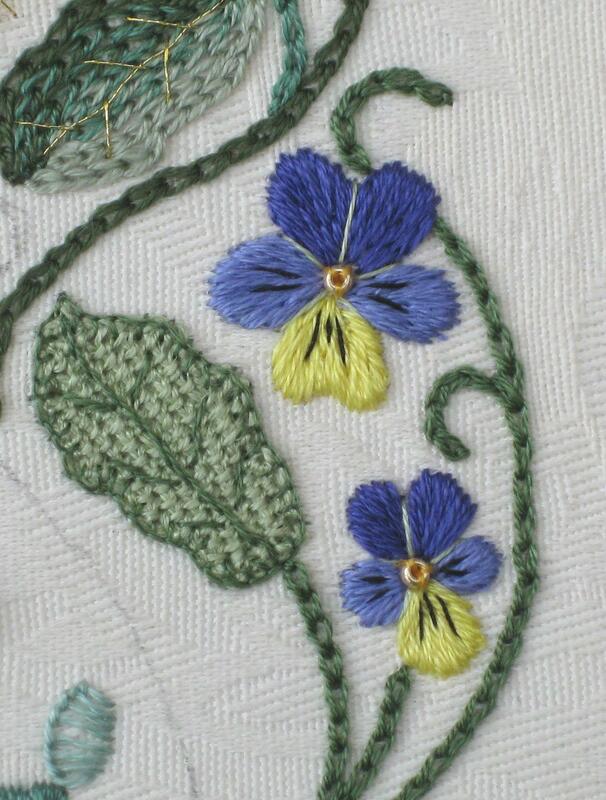 If you’d like to see where I design the doll’s house embroidery kits that are featured on my website (or you’re interested in how my control-freakery manifests itself in the way that I store things! 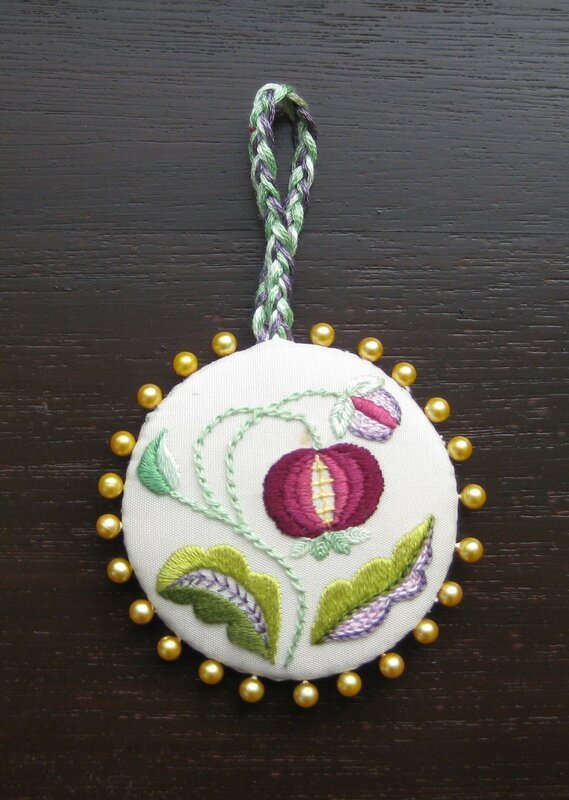 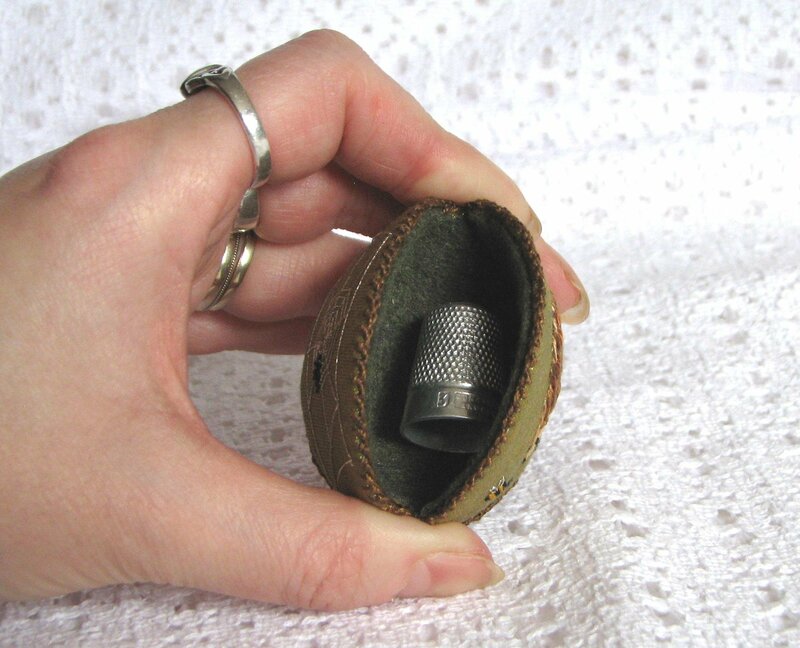 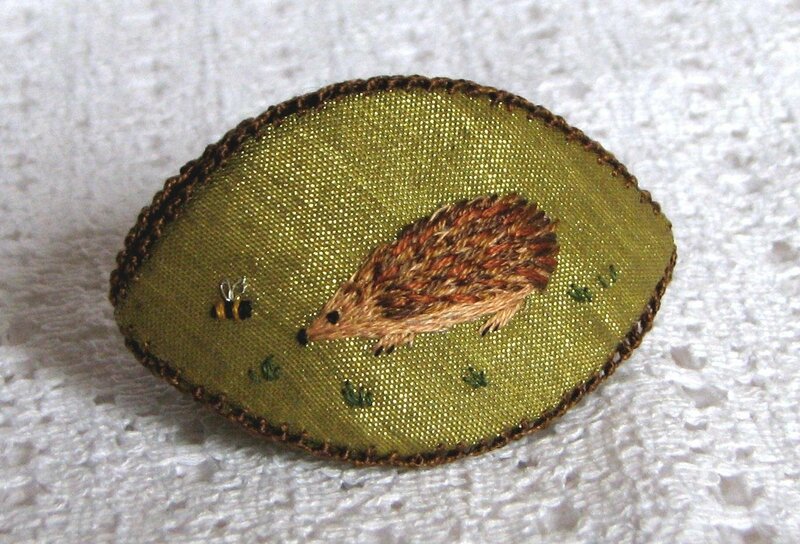 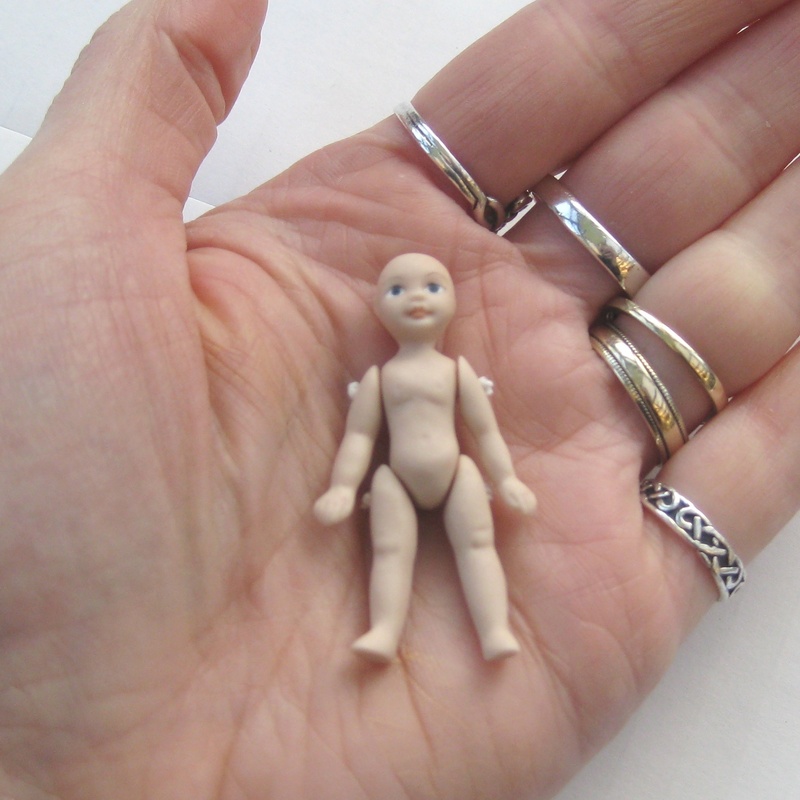 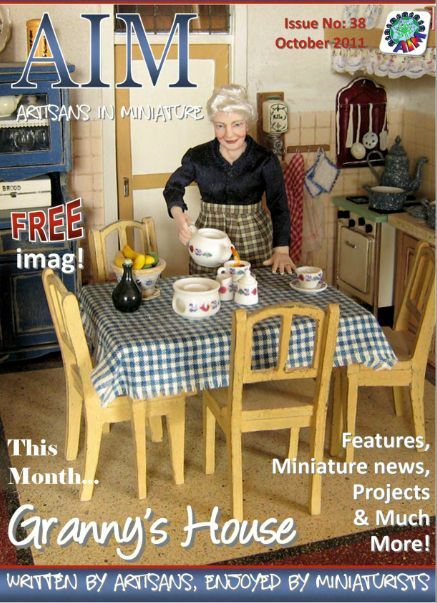 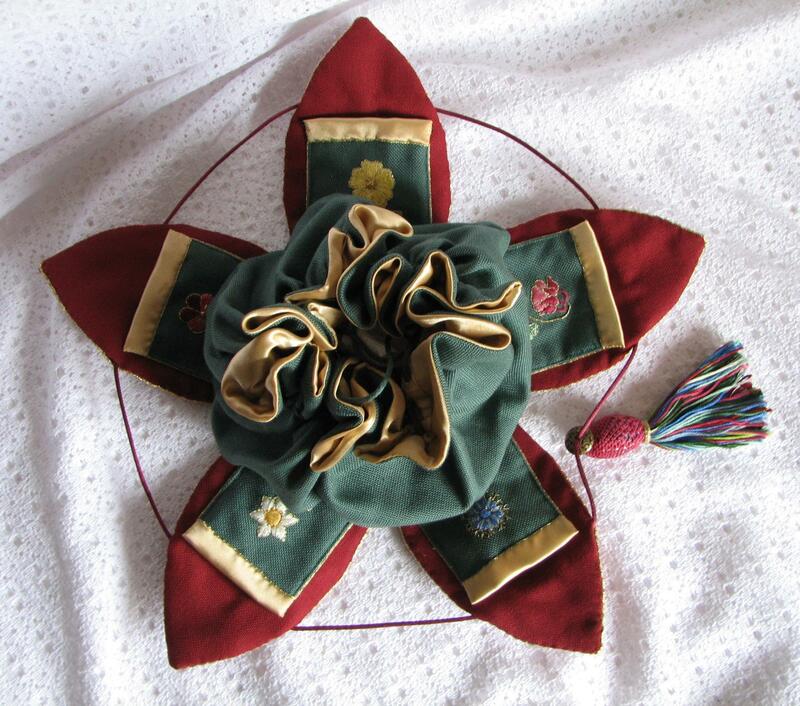 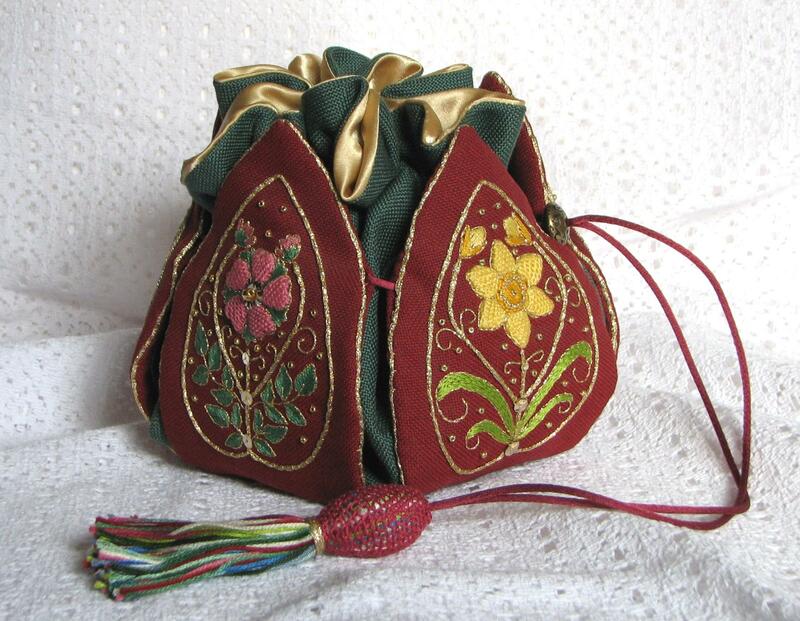 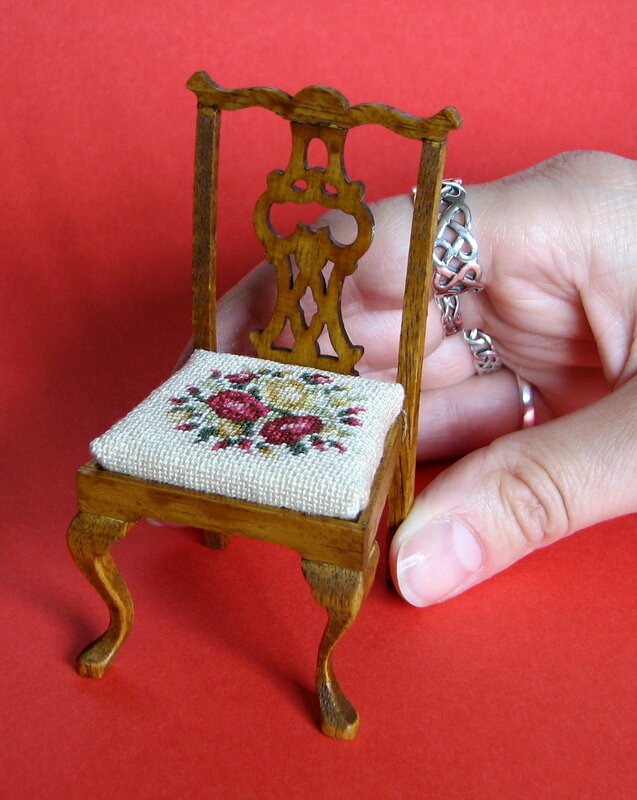 ), then have a look at this month’s Artisans in Miniature free online magazine. 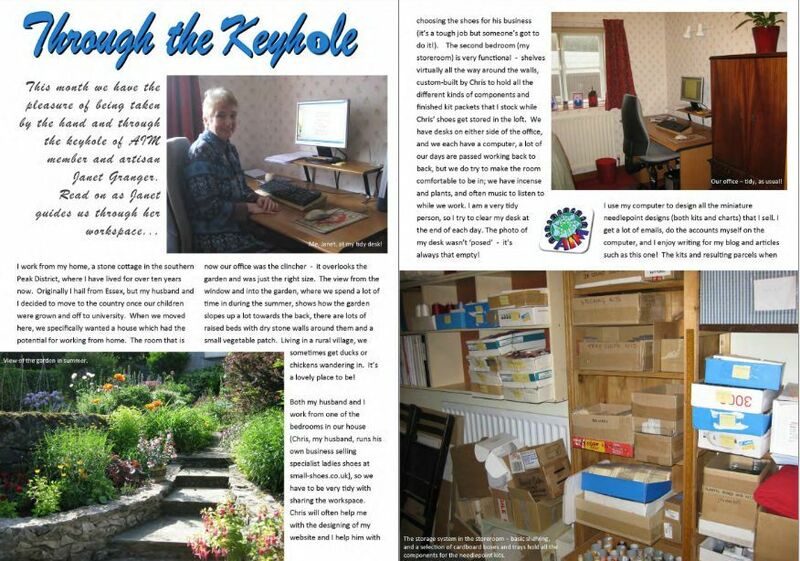 The article is on pages 54 to 58. 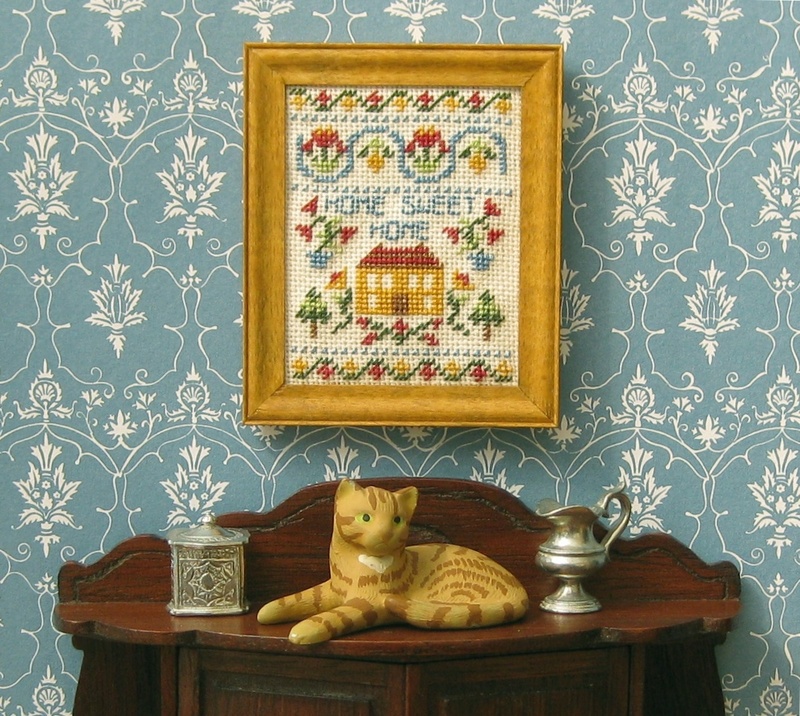 The general theme of this month’s magazine is ‘Granny’s House’, and it’s a very interesting issue, too!